Josh Geary maintained his three stroke lead after a third round 67 at the Barfoot & Thompson Akarana Open. Play was delayed for two hours this morning and intermittent showers threatened to disrupt play again throughout the day. 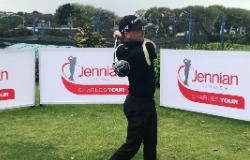 Geary stands at sixteen under par and three ahead of Michael Hendry 66, 67, 64 - 13 and James Anstiss 64, 66, 67 - 13, followed by Jared Edwards and Daniel Pearce at 12 under par.